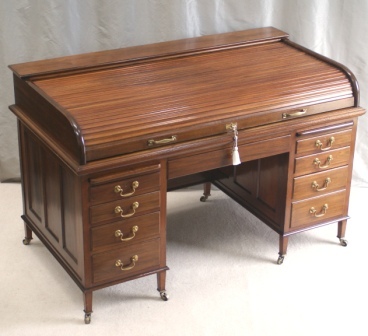 An exceptional Antique Walnut Roll Top Desk. This rare roll top desk is a late Victorian twin-pedestal roll-top "Britsim Desk'" made by G Alstrom, 76 Gt Eastern St., London, EC. The desk is made from straight grain walnut and was retailed by Thomas Clarkson & Sons, Furnishers, Snow Hill, Wolverhampton (label still in place). A superb quality Antique Roll Top Desk with many unique and original features - see the gallery of photos and the features list below. Not only is it a very practical desk for today's world it is a magnificent and impressive piece of furniture in its own right and a very interesting historic piece of Antique Office Furniture. Central drawer internal depth (front to back) = 21" (54cm).